The National Mango Breeding Program (NMBP) varieties 1201, 1243, and 4069 first caught Rai’s eye at a Department of Agriculture and Fisheries (DAF) field day eight years ago. Mareeba-based Department of Agriculture and Fisheries’ Principal Horticulturist Dr Ian Bally standing with mango grower Rai Bin in his new planting of variety NMBP-1243 at Mutchilba, Queensland. “These new varieties have an excellent flavour similar to Kensington Pride,” he said. Rai has now planted over 2000 of the new varieties on his Mutchilba property, near Mareeba, as part of the Australian Mango Industry Association (AMIA) commercial evaluation of the new hybrids. DAF mango breeding program leader Dr Ian Bally said the three varieties Rai has planted were selected for their high yields, excellent appearance and flavour, and early season cropping, which make them competitive. Rai is looking forward to seeing the first crop on his trees in December 2021. “They are a beautiful looking fruit, you can’t miss the red blush on them,” he said. 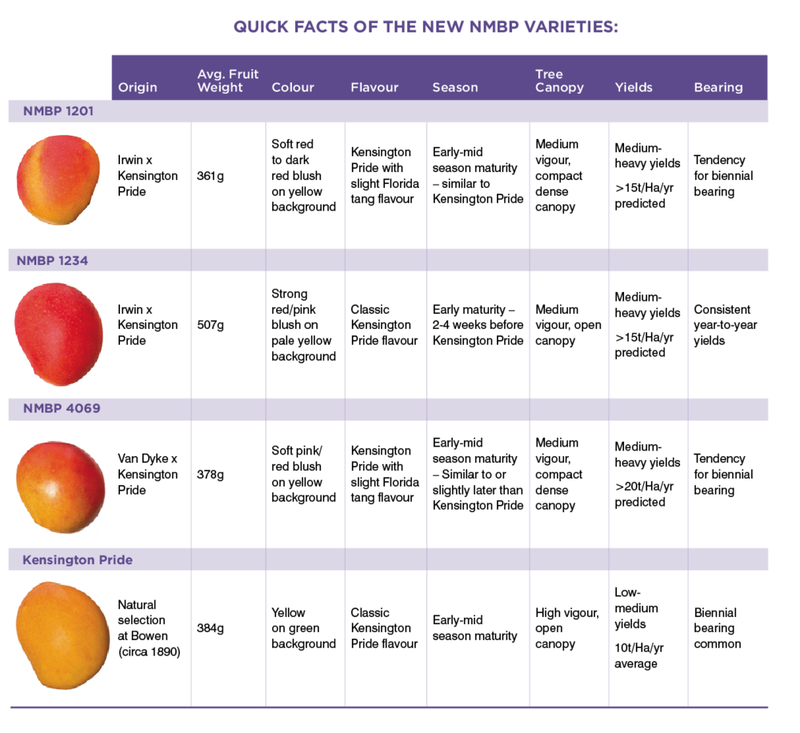 The new varieties are the result of the hard work conducted by plant breeders from across DAF, Department of Primary Industry and Resources (Northern Territory), Department of Primary Industries and Regional Development (Western Australia) and the Commonwealth Scientific and Industrial Research Organisation (CSIRO), who are dedicated to producing quality varieties for commercial use. The Queensland breeding program is continuing to develop new varieties for the future mango industry with improved productivity, fruit quality, disease tolerance and smaller tree size. Growers interested in seeing the new varieties first hand can contact Mareeba-based Development Horticulturist Ebony Faichney on 0491 212 948 or at ebony.faichney@daf.qld.gov.au. Growers interested in participating in the national AMIA evaluation trials with these three new NMBP variety trees (minimum of 500 trees per variety) can contact AMIA’s Samantha Frolov on 0400 810 365.